Black chairside end tables can give a dramatic look to your den or office. There is a wide range of black end tables from which you can select the perfect one for your den, office or other room. The first thing you'll need to decide is what style of end table you want. You may not be familiar with the term, chairside table and might assume it's simply another term for an end table; however, a chairside table is not quite the same. Traditionally, a chairside table is smaller than an end table. It's designed to be used along side a chair and designed so that proportionally, the two pieces of furniture go together. That's why a chairside table needs to be smaller than an average end table. One of the more popular styles is longer than it is wide, giving the table a narrow appearance. This design allows for the table to fit snugly beside a chair or even between two chairs. To determine if you need to use a chairside table is easy. If the space is too limited for a larger end table or a larger table would detract from the overall room design, then this table is an ideal solution. You can also find side tables that are round, oval or square. The most popular shape however, is the oblong, rectangle or wedge. You can often find side tables to match larger end tables to keep a uniform look or use a different table for added design interest. The table's modern design is a wedge shape that can be placed between seating without worrying about space. There's a wedge-shaped bottom shelf as well. This table is made from oak with an ash veneer, and has a shelf beneath the tabletop with a pull-out drawer at the bottom. This sturdy table offers not only a storage drawer but an enclosed storage shelf below with a door finished in the same design and hardware as the drawer. Made of poplar with a cherry veneer, the table is finished in black and the tabletop is finished in cherry. This table will give your room a nice casual contemporary look. This is another wedge style table with a bottom shelf. The table is made with solid birch table legs and a birch veneer tabletop. It's simplistic in style and is a very functional piece of furniture. 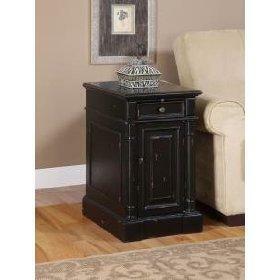 This European country style table comes in an antique black distressed finish. There is a pullout tray that's a great rest for a teacup or coffee mug, a drawer and an underneath door storage. You might find that a magazine rack table best suits your needs beside a chair. The first table listed below has five drawers and a magazine rack to make it a very functional side table. The second table has a pullout cut tray and a door storage below with the magazine rack on the side. Now that you have an idea of some of the many and varied styles available to you for your black chairside end table, you can decide which style will work best in your home.